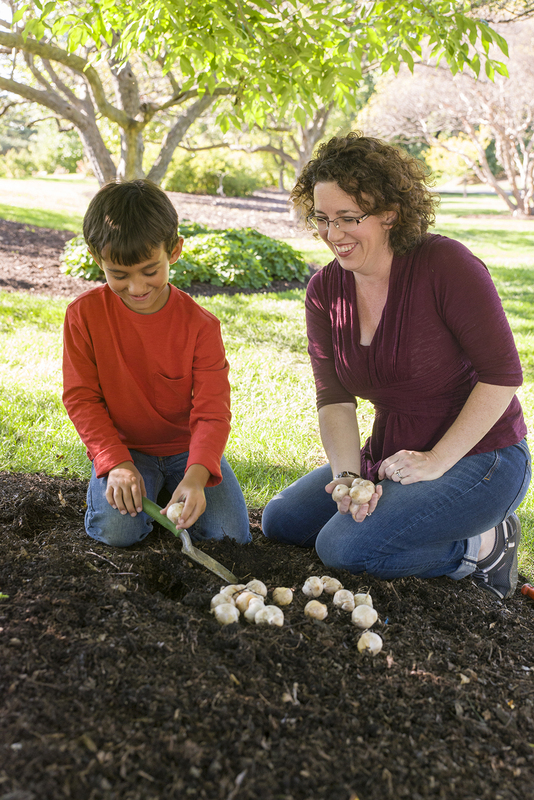 Planting bulbs together is a great way for children to learn about a different kind of plant. In the spring, the results are thrilling. James’s favorite part of planting: dropping in little “flower bombs” (the bulbs). Put your children to work! The general rule for planting bulbs is to dig down three times the height of the bulb. For example, if you have a narcissus bulb that is 3 inches tall, you would dig a hole 9 to 12 inches deep. For smaller children, pick smaller bulbs like ‘Tommy’ crocus (Crocus tomassinianus) or grape hyacinth (Muscari). Digging a deep hole for large bulbs can be a big job. There are several different kinds of bulb digging tools. I prefer a long, slender trowel when planting bulbs. 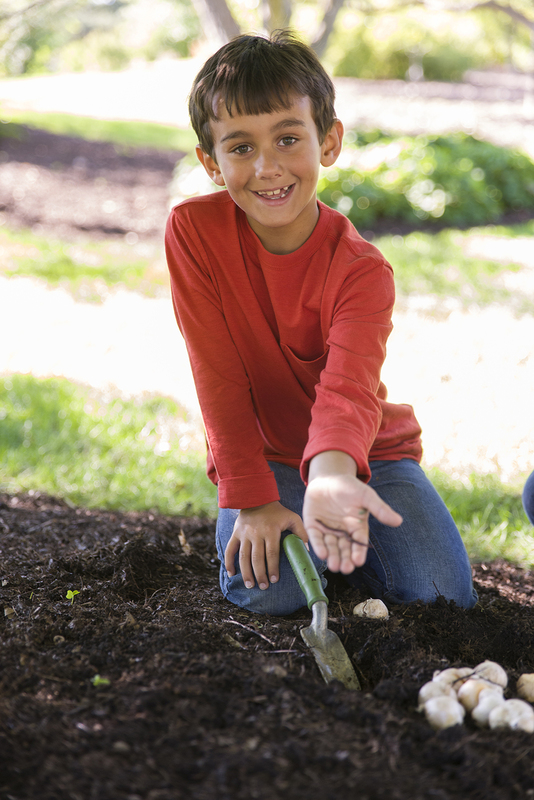 In loose soil, you can push the trowel into the ground, pull the soil back, drop in the bulb, and then pull the trowel out. In more compact soil, I prefer a bulb trowel that looks like a metal cylinder with teeth on one end and a handle on the other. The bonuses of getting dirty in the garden: finding a worm! My son is always eager to try out my gardening tools. We make a game of planting bulbs. We bury “flower bombs” (bulbs), water the soil and flower bombs when we are finished planting, and sometimes we even sprinkle some super food (bulb fertilizer) to help things along. The hard work pays off in the spring when those beautiful blooms push through the ground, show their leaves, and then burst open with spring color. Learn more about new additions and old favorites at the Fall Bulb Festival on Saturday and Sunday, from 10 a.m. to 4 p.m. Preview shopping for members only will take place from 10 a.m. to 4 p.m. on Friday, October 10. What an happy boy! And what a wonderful mother to pass along a love of gardening to a child that will likely develop a lifelong love of planting things and appreciating the natural world. Great story! Hey Stephanie, I read your story of planting with your son and I really like your idea of teaching children about the plants. But I think first of all, kids know that each flower bulbs have required a different planting time.